A Law Will and Testament is a legal document that appoints who will be in charge of your estate and what your final wishes are in regards to the distribution of your assets upon your death. Your wishes are outlined in a document which will outline, among other things, who will be the beneficiaries of your estate (all your assets both real and personal) and how the distribution of your estate will go. You can also provide for who will become the guardian and custodian of your minor children, create trusts for minor or disabled children and even provide specific gifts. Just how important is a will? Studies and surveys over the last several years consistently indicate that more than half of all Canadians do not have a last will and testament. The importance of a will is something that is often overlooked, as people think “I don’t have enough” or “I only need a simple Will.” But, you don’t know what you don’t know! Your will is one of the most important legal documents that you can have. There are a numerous issues that can arise within your estate, and among your loved ones if you do not have a will when you pass. For example, without a will, your death will be “intestate”. In Ontario, this means that your estate will be subject to statutory provisions to determine who will be inheriting your estate. This, of course, goes against your personal wishes, and can also add several issues to an already overwhelming situation. For example, if you have a legally married spouse and children, your spouse will not get it all. Seeing a lawyer who specialized in wills and estates to prepare your will can prevent many contentious issues from arising during an already emotional time. Or if they are no longer alive, then it will be divided among nieces and nephews, etc. Nowhere in this list does it consider a partner or common-law spouse to receive any part of your estate. Children are another factor that be overlooked. There are several issues that need to be addressed in your will with respect to your minor children. If you do not appoint a guardian and custodian over your minor children, it is common for disagreement to occur within the family. Although they have good intentions, each family member from both sides of the family, has their own reason why they are the best or right person to take care of your minor children. To you, there may be a difference between who is the right person to take care of children on a day to day basis, but may be an entirely different person who needs to be in charge of their money. It may be left to a judge to decide what is in the best interest of your child. Adult children also need to be considered. Questions such as do you have children from a previous marriage or relationship, are they disabled, do they live in Canada, do they have citizenship elsewhere, was there a loan or advancement of money to one child and not another? These are just examples of where things can go terribly wrong by not being properly addressed. The Wills & Estates team at Hummingbird Lawyers LLP can help you determine exactly what documents you should have in place as well as ensure that your wishes and the people closest to you are protected. Contact the Wills & Estates team today to set up a will for your estate. The team can help save your family any stress and future trouble in an already upsetting, and often overwhelming, situation. Hummingbird Lawyers strategically assists businesses and individuals in the areas of corporate law, commercial and residential real estate transactions, wills and estates, employment law and commercial and family law litigation. We are happy to meet with you in person, over the phone, by email, or live video-chat online! Prior to posting a contest or promotion on social media, you want to ensure you’re following guidelines on what you are legally allowed to run. Find out more from our latest newsletter. For entrepreneurs establishing a new company, business formation will help to outline your business’ structure. With a lawyer to help, the details outlined in a business formation include financing, executives, and any major pillars influencing company structure. As experienced business lawyers, allow us to help is setting up a solid, reliable business structure ensuring your organizations’ chance at success is maximized. Hummingbird Lawyers is thrilled to announce that we are a Vaughan Chamber of Commerce 2019 Business Achievement Award finalist in the Professional Services category! Top 3 - Hoping to win the top spot! Thinking of incorporating a Professional Corporation? 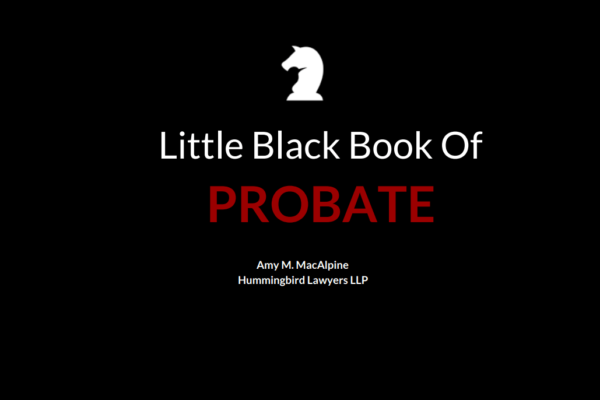 The Little Black Book of Professional Corporations is a collection of frequently asked questions along with their answers to help clients understand professional corporations better. Please note that the submission of this contact form or any other form of communication does not result in the creation of a solicitor-client relationship. How do Ontario’s laws affect you? Most people will face a legal issue at some point in their lives. Some will involve normal life events, like purchasing a home or writing a will. Others can be more difficult, such as seeking compensation for injuries resulting from a work or car accident, or working out the consequences of separating from your partner. Lawyers and licensed paralegals offer legal services to help you. These short Your Law videos are designed to help you learn how. Disclaimer - The information provided herein is for general informational and educational purposes only. It is not intended and should not be construed to constitute legal advice. The information contained herein may not be applicable in all situations and may not, after the date of its presentation, even reflect the most current authority. Nothing contained herein should be relied or acted upon without the benefit of legal advice based upon the particular facts and circumstances presented, and nothing herein should be construed otherwise. Please note that the use of this website, including any of its chat or contact forms, does not establish a solicitor and client relationship. In order to retain a lawyer at Hummingbird Lawyers LLP you must counter-sign a retainer agreement provided to you by a lawyer at this firm that is first signed by a lawyer at this firm. Please also note that while we do our best to provide a secure environment, there is always risk to you when submitting information online via forms, chat, and other means, and that we cannot be held liable for any breaches in security as it relates to the submission of any information to us via our website or other such publicly facing communication methods. We are currently licensed to provide legal services in Ontario, Canada.